LONDON: Prime Minister Theresa May on Monday published further assurances from the EU on the eve of a crucial parliamentary vote on her Brexit deal, and warned MPs that rejecting it would lead to “paralysis” that could see Britain stay in the bloc. European Commission President Jean-Claude Juncker and European Council President Donald Tusk repeated in a letter that they would not reopen the divorce deal, but said they could offer clarifications with “legal value” on a controversial clause on Ireland. In a speech shortly afterwards in Stoke, a Brexit-backing city in central England, May admitted their offer fell short of what she wanted. May had promised clarifications on the so-called Irish backstop arrangement when she postponed a vote on the agreement in December, facing certain defeat in the House of Commons. But as MPs prepare to finally cast their judgement on Tuesday evening, large numbers of her own Conservative MPs and her Northern Irish allies are still strongly opposed. Anti-Brexit MPs have now stepped up efforts to tie the government’s hands in parliament in a bid to avoid the damaging prospect of Britain leaving the EU on March 29 with no deal at all. May repeated that the only way to avoid “no deal” was to support her agreement, saying that “if no deal is as bad as you believe it is, it will be the height of recklessness to do anything else”. 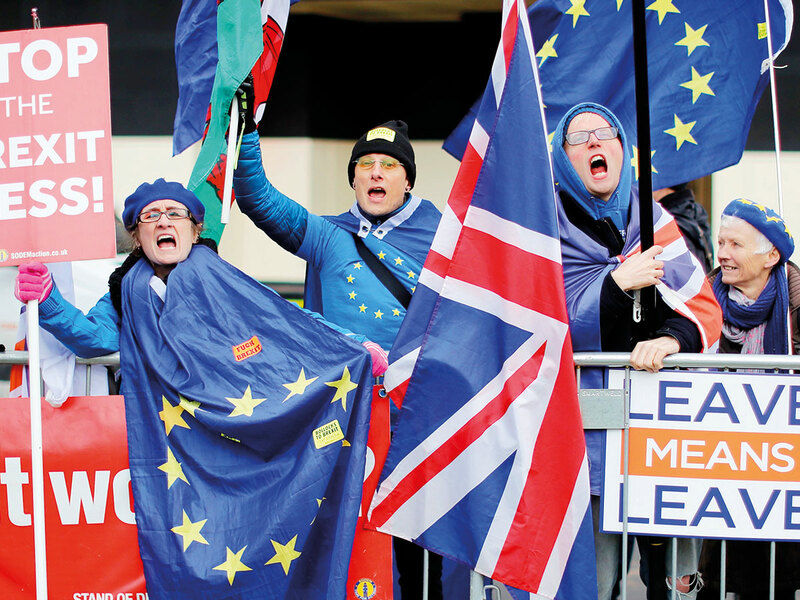 May signed the divorce deal with other EU leaders in November after 18 months of tough negotiations, but it has faced huge opposition in Britain. The most contentious element is the backstop, which would keep Britain tied to some EU trade rules, with even closer alignment for the province of Northern Ireland, if and until another way was found to avoid border checks with Ireland. Tusk and Juncker said the EU “does not wish to see the backstop enter into force” and noted that if it was necessary, it would only be temporary. They promised to work quickly to find alternatives to keep open the border, including using technology, a solution backed by Brexit supporters. The pair repeated that similar assurances to this nature made at an EU summit in December “have legal value”. May conceded however that the EU had rejected her request for a time limit to the backstop should it come into effect. Nigel Dodds of Northern Ireland’s Democratic Unionist Party (DUP), which props up May’s government in parliament, was dismissive. The EU leaders admitted they had no mandate to reopen the Brexit deal, he told the BBC, and so “obviously can’t do what is necessary for the House of Commons”. The opposition Labour party, which favours remaining in a permanent customs union with the EU, has suggested it will seek a no-confidence vote in the government if MPs reject May’s plan. If the government loses, parties would have 14 days to find an alternative that had the support of a majority of MPs, or an election would be called. Labour leader Jeremy Corbyn has conceded that, if the party won power, parliament would likely need to delay Brexit so it could renegotiate the withdrawal agreement. Speculation is growing in Brussels and London that May could also seek an extension to the Article 50 exit process if she loses the vote on Tuesday. May repeated her opposition to a second referendum, which a growing minority of MPs support as the only way out of the parliamentary deadlock on Brexit. There is also talk of MPs taking control of the situation by altering the rules of parliament. Conservative MP Nick Boles, who wants to keep Britain attached to the EU’s single market like Norway, proposes that senior MPs be allowed to frame a “compromise” Brexit deal. Should Notre Dame’s spire be rebuilt as it was?